I haven’t bought jam in years because it’s so easy to make at home. 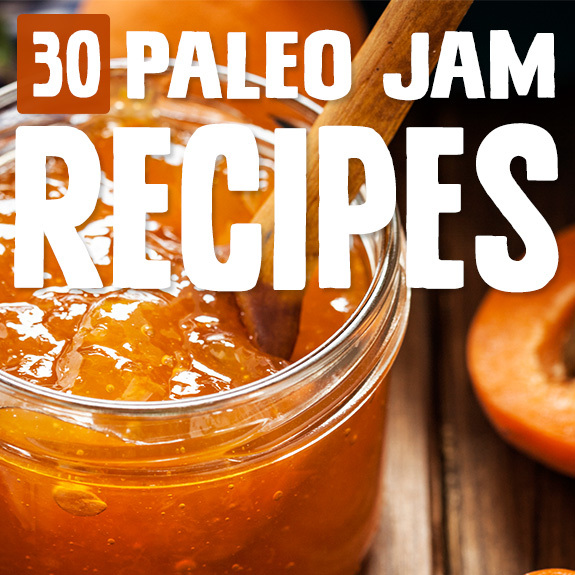 Try any of these paleo jam recipes, including chia jams, and be amazed at your homemade goodness skills! 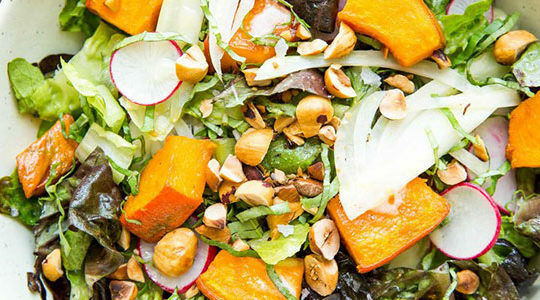 The beauty of this recipe is that it works both raw and cooked! 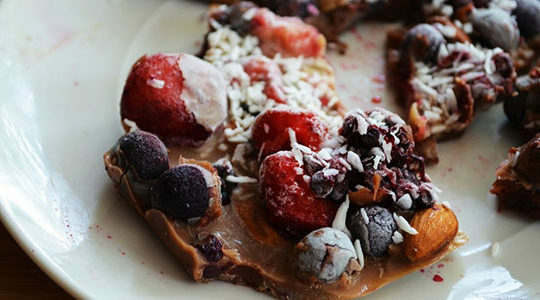 Obviously you’ll want to use the honey option over the sugar for this recipe. If you choose to do it cooked, you can even preserve it using a water bath canning method, and you’d have fresh fruit jam all winter! 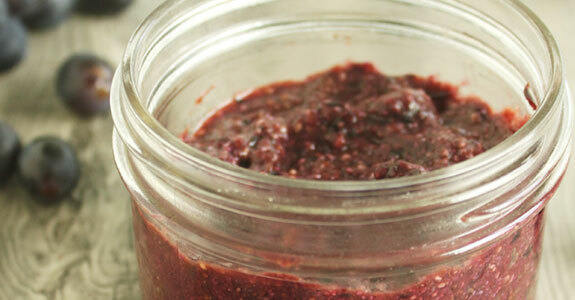 This chia jam (like all chia jams, really!) can be made with stevia instead of honey or other sweeteners. Add just the amount you need to make the jam sweet enough for your tastes. This might depend partially on how sweet your strawberries were to begin with, and how tart your lemon. Now we’re getting creative. This tomato bacon jam is made with roma tomatoes, bacon, onion, garlic, balsamic or apple cider vinegar, salt, black pepper, paprika, red pepper flakes, and maple syrup. Have it on paleo breads or crackers, or even on meats! The figs in this recipe are sweet enough that you don’t need to add honey or any other sweetener to this jam, which also uses deliciously sweet and tart raspberries. I’d love to swirl this jam into some hot paleo porridge for a sweet breakfast without sweetener. This jam has an amazing sweet and tangy flavor from fresh blackberries, fresh strawberries, raw coconut sugar, and freshly squeezed orange juice. You’ll boil it on the stove so the sugars begin to caramelize and the water cooks out and you’re left with nothing short of a jammy miracle. Strawberry Rhubarb used to be my favorite pie before I decided pie wasn’t really my thing—you know, with all the sugar and grains it usually has. So now I can get that same lovely strawberry rhubarb flavor from things like this pretty maple and vanilla cooked chia jam. 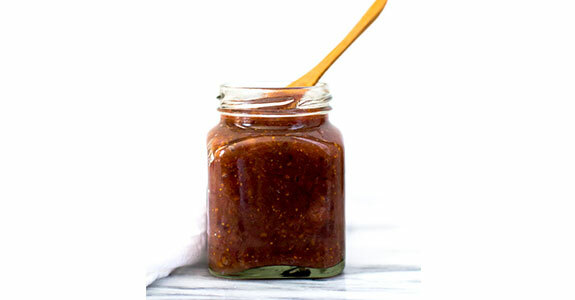 This peach chia seed jam has a secret: it’s a peach pumpkin spice chia seed jam! That’s right: this jar of goodness features honey, vanilla, and pumpkin pie spices like cinnamon, nutmeg, and cloves. Enjoy it made with the summer’s fresh peaches and freeze in small jars to enjoy it all year long. Here’s another chia-free jam, and this one’s a delicious orange marmalade made with honey, Seville oranges, and Meyer lemons. This is a recipe you can seal in jars and store all year, so you’ll always have some orange sunshine for a rainy day. This jam has raspberry as the dominant flavor, but a third of the fruit is strawberries! It’s cooked until syrupy with chia seeds and honey, and it’s the perfect companion for almond butter on paleo toast or swirled into hot paleo breakfast cereal. 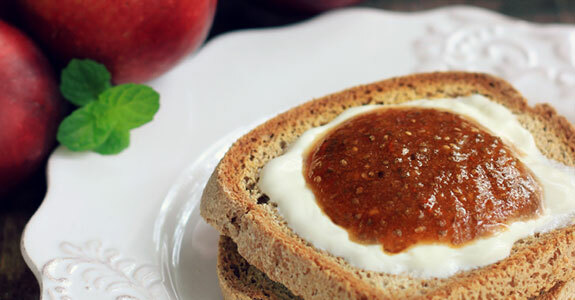 This chia jam is made with the tropical flavor of mango, and is sweetened with Medjool dates. The dates add a rich and caramel-like flavor to this jam, which creates a fantastic flavor combination with the strawberry and mango. This is my husband’s favorite chia jam! This jam is for those of us who have simple souls when it comes to jam. You don’t need fancy flavor combinations, spices, extracts, or anything special for this recipe. Just strawberries, maple syrup, chia seeds, and water. If your strawberries are very sweet, you may not even need the maple syrup. This jam may be better than butter, but it also has butter in it, which makes it even better! Wait, what? Nevermind the specifics. All you need to know is that this jam has bacon, butter, maple syrup, balsamic vinegar, Dijon mustard, sweet onion, and minced garlic. Chia seeds are great and all, but maybe they’re not your thing. Maybe your grandma doesn’t know what a chia seed is, and you’re trying to show her you can make a jam just as good as her strawberry jelly, but much healthier, and with unique flavors like lavender and rhubarb in this one! 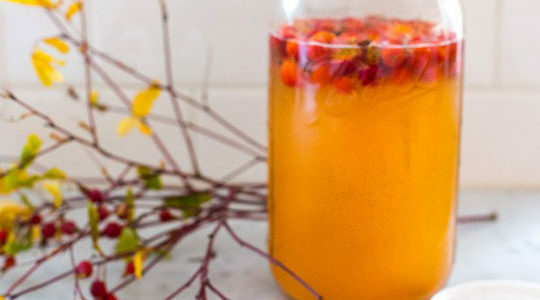 Certain herbs, like rosemary, can make a lovely addition to fruit-based jams. While you may have tasted strawberry and basil together, have you ever tried raspberry with rosemary? This one is sweetened with honey and apple juice, and is cooked so it can be preserved. This peach jam has a bit of cinnamon for a lovely spicy flavor, and is sweetened with maple syrup. The maple is optional, so if your peaches are sweet enough or you’re trying to avoid added sweeteners, you can feel free to just leave it out or add less than 2 tablespoons. 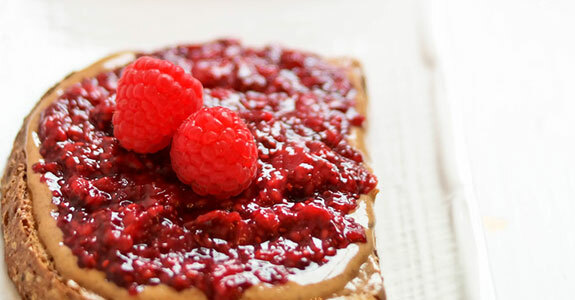 Made without chia seeds, this raspberry jam is flavored with lemon, cinnamon, and balsamic vinegar and has a base of chopped rhubarb, raspberries, and maple syrup. You’ll use agar agar flakes to thicken it into a spreadable jam. If you want a pure blueberry flavor with a rich, beautiful purple color, this is the jam for you. It’s sweetened with honey and thickened with chia seeds, and only takes about 20 minutes from start to finish. 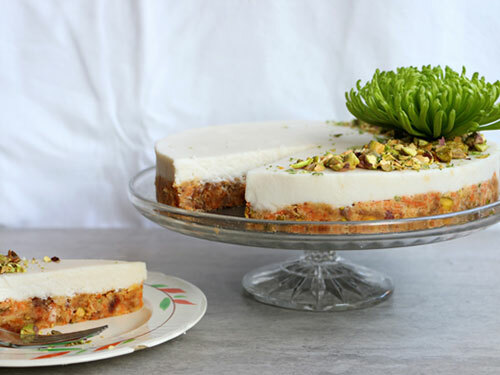 I’d enjoy a swirl of this with some coconut whipped cream for an easy dessert. This bacon jam is made with onion, coffee, honey, cumin, and balsamic vinegar for a fantastic combination of flavors that’s perfect on burgers, roasted chicken, or paleo crackers/bread. It’ll last about three weeks in the fridge, but I doubt you’ll be able to leave it alone long enough for it to get that old! This pretty purple jam is full of lemony blueberry flavor that’s just the right balance of sweet and tart. It’s a cooked jam that’s sweetened with honey, and you can make it with frozen blueberries, so there really are no more excuses for not giving homemade chia jam a try! Roasting fruits can help them develop a candy-like sweetness by caramelizing the sugars and reducing the water content. It’s one of my favorite special tricks! 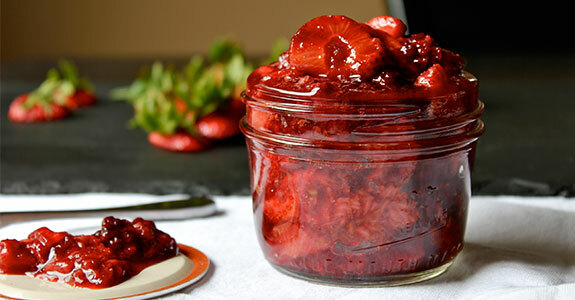 This roasted rhubarb strawberry jam is sweetened with coconut sugar and doesn’t require chia seeds. Perfect! 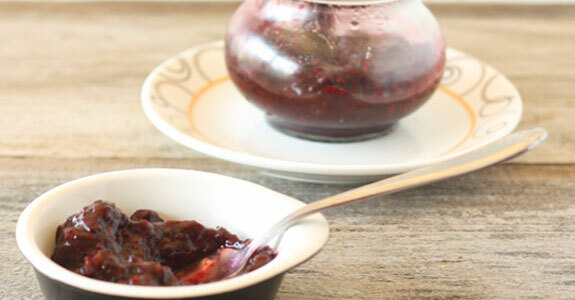 This beautifully flavored jam is perfect for a chilly fall or winter morning. I love spiced jams, and cinnamon goes so well with plum—but don’t even get me started about the brilliance of including a few teaspoons of bourbon in this jam. So perfect. Figs grow really well where I live, and I’ve been enjoying them in all sorts of ways lately, including this sticky vanilla fig jam with cinnamon, honey, vanilla extract, and coconut oil. 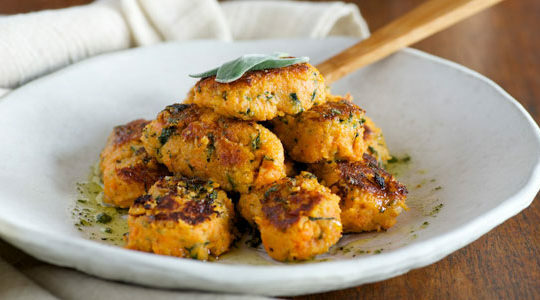 You could enjoy this on paleo crackers or bread, or even with grilled meats! This jam makes a lovely condiment for rich meats like lam, and a little goes a long way. It’s richly flavored with butter, dry white wine, honey, and balsamic vinegar. 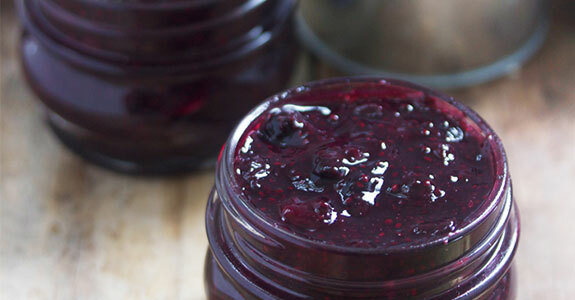 You’ll love the earthy taste of this jam with savory dishes, or even on paleo rolls. 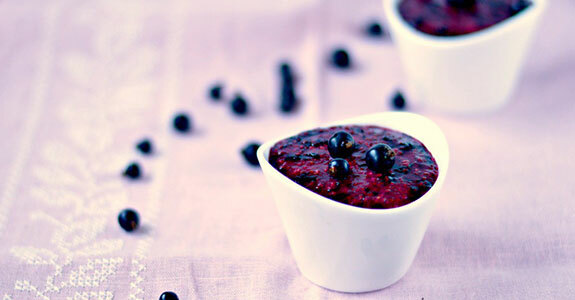 If you’re not a fan of the little lumps in chia jam, this is the recipe for you. Processing the finished jam in a food processor grinds the seeds so you’re left with a silky smooth and spreadable jam with a lovely tart flavor made complex with vanilla bean and extract. Got a kiddo who’s missing their grape jelly? let them get their fix with this coronation grape jam. 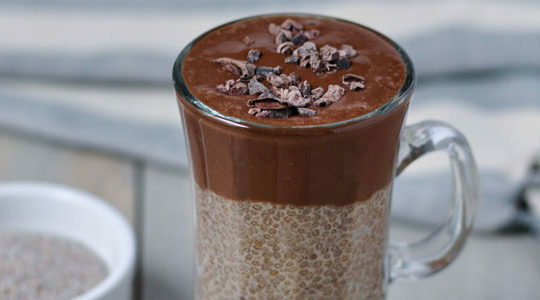 It’s sweetened with stevia so you know they aren’t getting any added sugar, while the chia seeds provide a healthy dose of protein, Omega 3s, and other goodies. This awesome jam doesn’t require chia seeds or even the use of a blender. You’ll grate fresh ginger and combine it with mashed raspberries and a bit of honey and lemon juice. The flavors are bright and zingy, and naturally sweet! Tomato jam is one lovely way to preserve the summer’s bounty and enjoy fresh tomatoes all year long. You could freeze small jars of this jam, or follow a recipe for water bath or pressure canning to save yourself some valuable space in the freezer. This jam cooks up in just a few minutes with sweet and flavorful Mission figs and beautiful red raspberries. It’s sweetened with honey, flavored with lemon zest, and doesn’t require chia seeds, so if you’ve had enough with the chia already, give it a try. You really can make chia jam with almost any type of fruit, and while it works well to make it raw, cooking your fruit can deepen the flavor and slightly caramelize the natural sugars to the jam will taste awesome, and a lot like store-bought varieties, only better!